Springtime, it brings hope and opportunity here on the river. Blog for 6 Dec. So, in theory at least its the 6th day of summer here, but the weather is its normal unsettled self for this time of year, warmer than usual so at times the weather is more extreme. Its odd, when you’ve not been working in the shop for a while, the place gets really untidy, tools get hidden under things, other things aren't in the places where they should be, the floor looks as though its never seen a broom, and you can't walk from one end to the other without tripping over stuff. It has to be gremlins, sneaky little buggers, I’d never leave the place like that. I’ve had more than a few distractions of late, a combination of things together with more rain than usual meant that “the summer of the paintbrush” didn’t happen last year, that plus other maintenance issues on the old ship meant that I wasn’t gaining on it. Rot pockets, several of them, one pretty big, had to be dug out and new wood grafted in, sanded flush and new paint applied. Every time I thought I had it all done, I found another one. I think I’ve one to go, but with a 45 year old boat that had been pretty neglected for a long time, there might well be more. But I’ve been doing small jobs as time and other issues allow, and there are little patches starting to look ok. I’ve redone almost all of the interior varnish, that’s easy, it can be done in small sections, a light sand, 5 coats of satin finish oil based varnish applied with a sponge brush and she’s looking ok inside. I’ve done some woodwork in there as well, plus replaced a couple of plywood panels, they don’t match but what the hell, they’re there and do the job. But it’s the outside that really needs the work, plus the paint in the inside of the flying bridge upstairs is in really bad shape. So I’ve started on that, done the control console, rewired the anchor and steaming light which is now on the new light mast that I’ve built. I was, if not doing the big jobs, getting small ones done, that mast being one. Also managed to get the port and starboard navigation lights working again, the wiring on this old girl is a real mares nest and I’ve been gradually rewiring sections of it . That’s not an area of expertise that I’m familiar with, but each time I do a bit I learn some more. So, now I’m legal when motoring at night or at anchor away from my dock . We don't see much of the sun for a while when the sun is low in the winter, so lichen gets a start on the parts of the old ship that I don't get to as often when I'm parked here. That spotty stuff on the windows is lichen, its been sprayed with 30 seconds, not quite "spray and walk away" but effective. I'll be scrubbing it off this afternoon. The "wheel" has been stripped, sanded and varnished, multiple coats, and the brasswork cleaned off. I've relocated the compass, I'll have to swing it when I get out to sea and there is space on top of that console for a deviation card that I'll make up. The GPS is permanently located downstairs so a compass up here is helpful if the visibility outside is not so good. That "yellow" paint is in fact "Oyster white", much more yellow than I remember it from boats on which I've used it before, but they were a long time back. Its an ok colour though, less harsh than the pure white that is there now. Visible too are the wires and some of the fittings from my electrical work, I'll paint the rest of the area before pinning the wires in place. Now all I have to do is get the rest of the ship looking like that. I’ve begun with the paint on the outside, got primer, one undercoat and one top coat on one side of the cabin, one more coat to go on that side. Lots more to do, but if I do a bit a couple of times a week I’ll get there eventually. This summer looks a lot better than the last for a whole lot of reasons, one being that I’m in better shape and better motivated to get things done. I AM going sailing this season, and with the issues around camping ashore that there are, decided to get my little ship “Spook” out from under her covers and sort her out so I can go cruising. She’s an 18 ft on deck gaff sloop with a long keel, traditional styling, a cabin with a little galley, two bunks and enough storage for a week away, a while back I built a really efficient icebox so I’ll have the luxury of keeping such as cheese, milk and meats. As I said, unlike the several years just past, I am going sailing this year. So, damn all the other jobs that I should be doing, I started getting Spook ready on Sunday. Hauled the tarp off, stripped everything out of the cabin and the lockers, and the gremlins have been in there as well so there were a few surprises hiding in the lockers. Including I must say, the cheap hand crank combination lamp, radio receiver, phone charger unit. The surprise was that works, still, after not being touched for four years. The L/Ion battery powered cabin lamp still has charge in it, and the black jelly beans in the screw top jar in the galley were (past tense, they’re all gone) edible. Much else went in the trash bin. All of the exterior brightwork needs re doing, I think it was done with two part polyurethane so getting it stripped back is going to be a pig of a job. That stuff doesn’t sand off well, but comes off in sheets where its failing, so it’s a scraper job. Incidentally, I inherited a "Skarsten" brand scraper, I'd never used one before and initially it wasn't doing the job. But I recall, way back, reading in a Practical Boat Owner that unlike the carbide scrapers with their replaceable blade these should be sharpened. I did that, grinder, then oilstone, and its seriously good at removing that tired and peeling varnish. Never too old to learn eh. I’m working on her at Mums place, alongside her brothers workshop. Sadly, now in his late 80s he’s not able to do much these days, but it means that I have a place to work on her (the boat not mum) that’s close to a power point and tools. 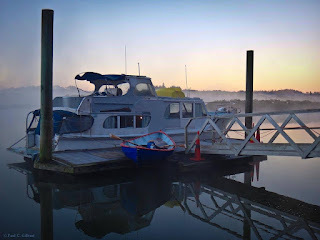 Living on my big boat, tied to a dock at the bottom of a very steep and muddy track means I don’t have access to that for this 1200 kg boat here at home. Pluses and minuses. Mums place is about 20 mins away so that’s not too bad. I was going to be working on her today, but we’ve had what was possibly the most intense thunderstorm I’ve seen in NZ (I’ve been through a hurricane in the Caribbean, the lightning flashes were so close together you could read a newspaper by them), apart from all the noise and lightning, my little SEI , 15 ft double ender, got picked up off the dock by the wind, and flicked against the side of my ship, breaking both gunwales, punching a small hole in her planking and doing a whole lot of cosmetic damage as well as punching out a window on the ship. MORE jobs to do. I’d thought of doing some drawing, I’ve not been able to do much on the drawing board for a while, but had it set up ready, pens all working, (Rotring Rapidograph, touchy things but their new ink is better) and, what do you know, during that storm it got tossed off the table and now I’ve got to start from scratch to get the drafting machine all straight and square again. Ever had one of those days? So, today, being thoroughly annoyed and demoralised, I chose a small job that I knew I’d get done. 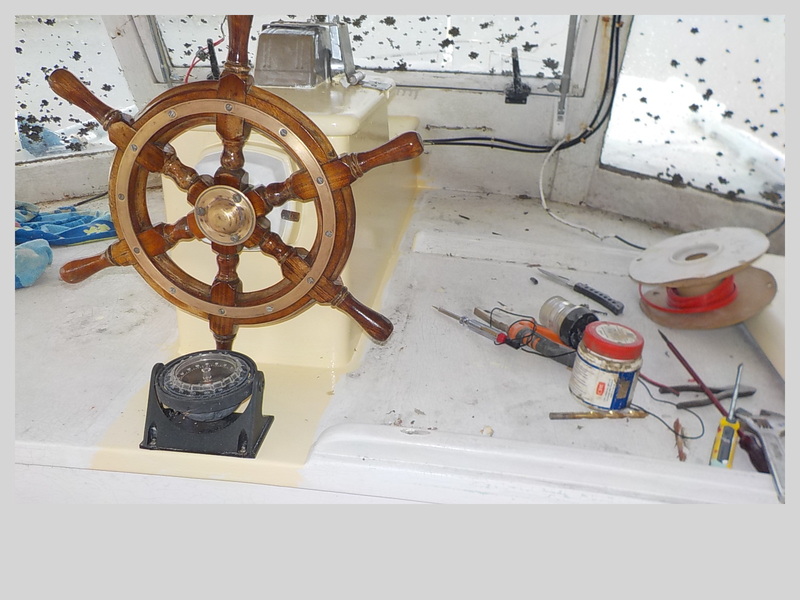 I’d stripped and revarnished the flying bridge steering wheel last week, between all the other stuff in my life, and today I polished the brass rings, found screws to replace the missing ones and put it all back together with Anhydrous lanolin on all the threads and the taper. Its all done. Its nearly Christmas so I’m going to pull some clean trousers on and go out to buy some pressies for the granddaughters. If you’re finding this all a bit boring, remember that here in NZ its getting close to summertime, dinghy cruising time. Here is one of Steve Parkes excellent video essays to remind us just how great small boat cruising can be. https://www.youtube.com/watch?v=eJmGj4u_fss If that doesn’t inspire you, nothing will. Thanks Steve, your videos are much loved. He snores, my little dog, as he lies sleeping on his rug. Dawn is still an hour away so he’s entitled to sleep, but I’m sitting up in my bunk looking out over the water, watching the ripples distorting the reflection of the lights on the hills above. I don’t mind his gentle, rhythmic rumble, I imagine he’s really saying to me, “I’m here boss, you’re not alone, if there is a threat I’ll be there with teeth bared barking in my best don’t mess with us, voice. Don’t feel lonely boss, I’m here”. And I don’t. My litle ship, my floating home is rising with the tide, its like being lifted by the slow heartbeat of the world. It’s a big tide this morning, one that covers all of the mudbanks, bringing clear ocean water in even this far up the estuary, changing the colour from brown to grey green. Its too early yet to think of what the day might hold, the planning of the day, the jobs that need doing, what is urgent and what might wait. It’s a time to relax, to watch the hypnotic march of the tiny waves, listen to the birds awakening and proclaiming, “I’m here, this is my place, I’m here, listen to my song”. There is some pale light above the horizon now, being winter its late, but winter sometimes brings a clarity of light that we don’t see in the warm haze of summer and while the sun is close to its morning appearance the stars still shine, bright and sharp. Its going to be a good day today, I feel very privileged to live here on the river, afloat, so close to nature and the natural things around me. The water is not my friend, nor is it my enemy, it is impersonal in its actions, but I am content when with it, close to it, borne up by it. Living here has me close to the moods of the sea. It can be peaceful, gentle, filled with promise of reward. It can be angry, threatening, capricious, or playful. But its rarely the same for long, the constant change is enough to hold my attention always. There is peace here, watching the water is enough to so occupy me that the world of mankind does not trouble me. I understand those for whom long voyages out on the ocean call so strongly, but here in the shelter of the river I can have both. Waking here is a wonderful thing, so near, and yet so far. Its light now, my little dog still snores, but he’s muttering under his breath, grumbling as he wakes. In a moment we’ll go outside, and we’ll both look out over the water before we walk off together to see what the day has in store for us, there are rats that need catching, both for him and me. "Dawn on the River." Photo by Paul Gilbert, Aquapix. Starting to put in the fiddly bits that can make all the difference. Inside my little shelter, cuddy, dodger or whatever it might be called there is enough width to sit across the boat, feet on one side, back against the other, tucked in under the “veranda” out of the weather. There is space to do that while cooking or getting clothing out from the big dry lockers forward, maybe even to get changed while its raining outside. To access the latter, the hatch swings open, and is latched there, to put away again, just close the hatch and dog it shut. The cuddy is a multi use space, and its important that its comfortable to use. But sitting in there, dreaming of being out at sea, a problem came to mind. It was damn uncomfortable! The inside edge where the side deck meets the “cabin” side is in just the wrong place, it cricks the neck, leaves the back unsupported and, as I said, is very uncomfortable. There is too the issue of the little bits and pieces that need to be ready to hand when out there sailing, the main stowage in Long Steps with its air tanks sealed off by screw top hatches are not suited to this use, it takes too long to access them, so, on with the thinking cap. The answer, a pair of lockers that fit in under the side decks, the faces sloped a little to make a nice back rest, the floor of the locker seated on top of the second stringer down from the gunwale, and the space divided in two halfway along. Finishing the lockers at that height means that there is still space to brace me against the sides with back against one and feet against the side of the boat under the lockers on the other. There are cutouts in the face of the lockers for access, those will have stretchy nets over them so things stay put but easy for a hand to pull the shock cord down and reach in. What goes in there? The hand bearing compass, some granola bars, the small thermos flask with the hot chocolate in it, my spare hat, ( I seem to have left hats in the sea in many places) gloves, sun cream and such. I’ve dummied those lockers up in 6mm plywood, tacked them together with epoxy and after that set up, have taken them back out to coat with sealant and paint the insides, They need a little sanding then they can be fitted back in with glue and screws to hold them in place and the standard of comfort will be vastly improved, all the way from say, half a star to three quarters of a star. The local cheap motel might be 2 stars but the view from Long Steps little camping shelter will more than make up for the difference in amenties. Ready to be finished off, coated inside and out, then permanently glued into place. Its just sitting there to test fit for size, but you get the picture. Yes there are drain holes in the little locker floors, but I sincerely hope that I never get any water in there. 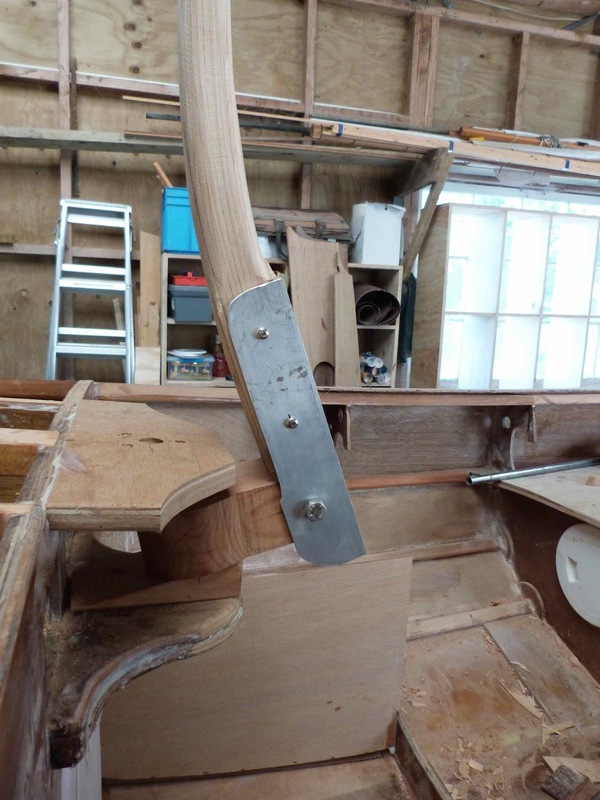 Other progress, I’ve fitted the seat top nosing piece to the starboard seat, hidden the screws with “proper” wooden plugs, and have fitted the doubler under the after edge. That latter is an area where I expect to be standing up at the helm quite a lot, and the doublers mean that I can put a much thicker rounding on that edge so making contact with my shins a bit less painful. As well, now that the seating, including the moveable rowing seat, is in place I can begin to contemplate what the rowing position might be. An idea that is cooking away in that maze of wandering paths that is my mind, is that if I make up some tall rowlocks I would be able to stand up and row facing forward, pushing on the oars to move the boat rather than sitting facing aft and pulling. That would be a good way to rest the muscles, taking it in turn with the more conventional rowing position, as well as being good for manoeuvring the boat into a small space such as a dock or marina berth. Two piece oars! I will be needing long ones, so its off to Duckworks Boatbuilders supply for the carbon fibre oar sleeves, I’ve used the smaller ones on lighter oars, very successful, but this will need the big ones as the oars will be around 2.8m long ( just over 9 ft). While the brain was working, and yes there are times when it doesn’t, I began construction of the anchor stowage bin under the tiller. With the anchor there I can veer it or retrieve it from the cockpit which will mean that I don’t have to go out there on that tiny foredeck when it’s a bit rough on the water. Having sides, in just the right place means that I can very easily put seats out from the bin to the sides, just in front of the tiller bulkhead, still leaving space in which to stand, those seats will enable me to sit, back against the curved coaming and one arm resting lazily on the tiller, my weight in the right place when the boat is reaching or running. Comfort again. Pleasure in the sailing of a small boat is largely about being comfortable. 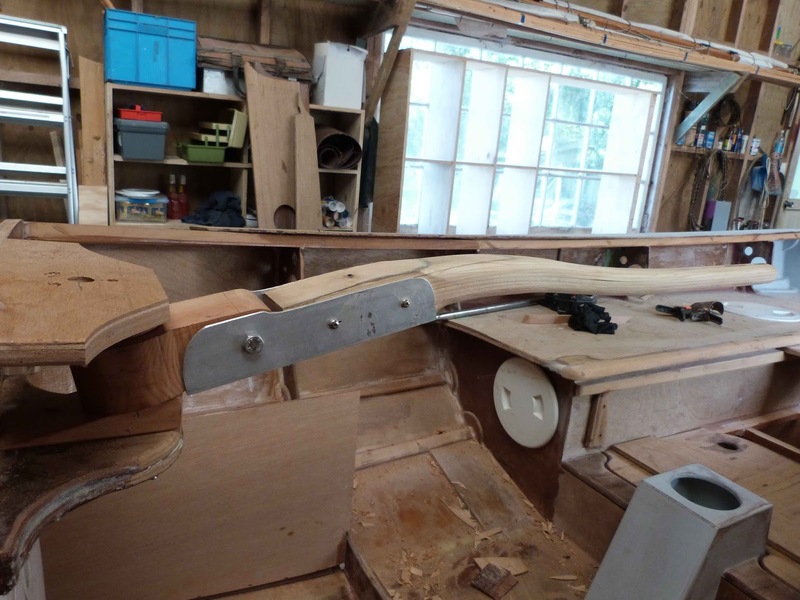 Back in the workshop I’m taking a break from the “big” parts of boatbuilding, spending a little time making up the smaller bits and pieces that will be needed when the boat itself has been completed. The rudder and tiller assemblies are the current project, the tiller and its pivot being more complex than in a boat where the helmsperson can sit close enough to just hold a tiller that’s directly mounted on the rudder stock, means that there is a bit of fiddly work to do here. So I went to a local aluminium window fabrication company, had a dig through their scrap bin and found a piece of box section, 65 x 65 inside, with 3mm walls. That’s easy to cut, just use the sawbench with its usual tungsten carbide blade but take it quietly and it cuts fine. I sliced it back to a channel shape, 50mm deep, and shaped the pivot head to take it. I cut the curve on the end with the bandsaw, the blade on that is not a carbide one, but the hardened teeth handle the aly just fine. A hint, if you do this sort of work, make sure you clean all of the aly chips off the saw before you go back to cutting wood, having metal chips in the surface of your fine woodwork doesn’t help things much. I drilled the shaped channel for a hinge pin so the tiller can be lifted up slightly past 90 deg, and put all that in place temporarily so I could make up a “dummy” to guide the making of the tiller. Found a piece of hardboard in my scrap pile, and yes that scrap pile is very useful at times, and clamped it into the aly hinge piece, sat in the boat with a sharpie pen, held my hand about where I’d want it, and drew the tiller shape. One of the issues here is that the tiller needs to be long enough for me to sit on the side seats just aft of midships, thats where my weight needs to be going upwind. In a fine ended, relatively narrow boat like this proper crew weight distribution is helpful to the boats performance. I'll be in the back corner by that bulkhead that you can see there when on long downwind runs. The tiller template cut out, I've set the height of the "grip" end of the tiller so that my forearm is level, parallel with my thigh when I'm seated. Thats a comfort thing. It is though long enough so that if I'm standing at the tiller I'll need to hinge it up as I walk across when tacking or gybing. 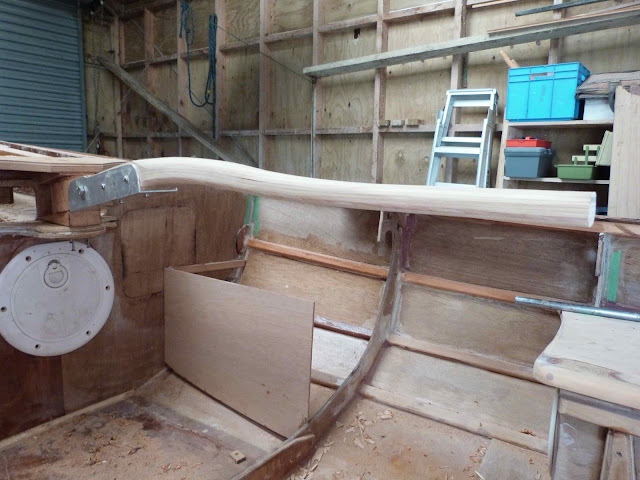 I refined that a little, cut the shape out on the bandsaw, clamped it back in place and sat in the boat with my hand on it to check how it felt. It felt fine, so fine sitting at the helm I had trouble stopping my dreams carrying me away, could have sat there daydreaming for far too long. Next, time to make up the real thing. When cutting thin veneers the saw loses about half of the wood in sawdust, that’s a bit sad but there is no other way, so half an hour later that three metre piece of 130 x 25 was split, and the 70mm wide piece converted into 3mm veneers, the Leuco blade leaving a finish very much ok for glueing. Next job, a jig. I grabbed an offcut piece of melamine laminated particle board, the stuff that they make cheap furniture of, drew around the outline of my tiller template, masked that with packing tape and screwed my laminating clamp blocks along the line on one face of the shape. Much gluing, using the same homemade epoxy spreader that I use instead of a paintbrush, I applied a very thin glue mix to each face of the laminates as I laid them up. As there were 12 layers in this, thin ones because of the relatively sharp bend, I started off with only six. Clamped them at one end, and worked along with the clamps, pulling them in in sequence a little at a time until they were hard against the clamping blocks. Half the veneers glued up, 5 more to go. 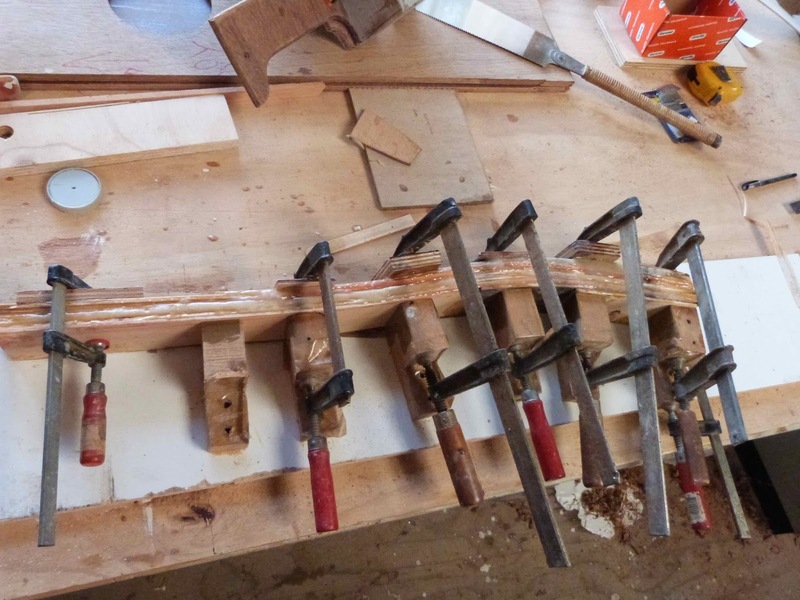 Fast forward a day, and I took the part tiller off the jig, tidied it up with a plane, put it back on and glued the rest of the layers on using the same clamping process. The last 5 on, doing 12 in one shot is fussy work, every piece is trying to escape, all slippery with epoxy and under tension, so I've done it in two stages, the first layup having enough pieces to stop any springback when the clamps come off, then next day, after a bit of a cleanup to take any lumps of glue off, the rest get coated and clamped on. Next day, and if you’re doing this sort of laminating do give the glue plenty of time to cure as the layers will be doing their best to pop back straight again, it came off the jig, and it was time to attack it with the bandsaw, then the spokeshave and carve it to its finished shape. With the “blank” off the jig, the first thing was to outline the shape with a pencil, then run it through the bandsaw to rough out the shape. This wood is Mangeou, a soft but very tough New Zealand native wood, it saws and machines well but is a stinker to use a plane or spokeshave on as the shavings tend to jam the mouth of the plane. So it was out with the angle grinder with the 40 grit sanding disk on and some delicate work, light with the pressure and steady strokes to get it shaped. I’ve gone for a horizontal oval shaped hand piece this time rather than a round one, it fits my hand well and provides a place for the tiller extension swivel to be mounted. Rough shaped, in place, that looks ok to me. 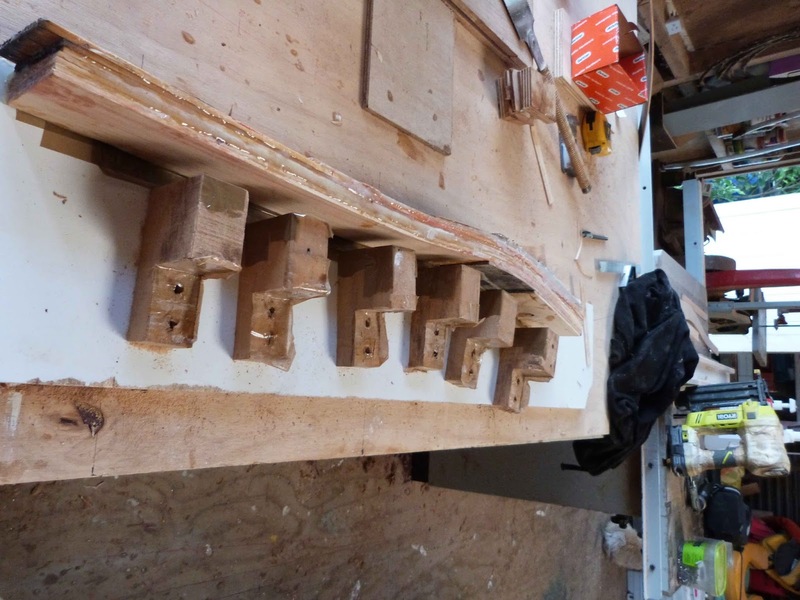 I've still to make up the yoke that will connect the tiller to the yoke on the rudder head, thats a job for another day. After the angle grinder it was time for the fine and finishing work, so the Shinto Rasp (http://www.duckworksbbs.com/product-p/wood153777.htm) came into action, a great tool this one, one of those I don’t know how I managed without before Duckworks supplied mine. From there its sandpaper, working down through the grits until its time for the varnish. The tiller in close to its finished state and position, the pivot pin is a piece of 20mm stainless steel tube cut from a bent lifeline stanchion salvaged from a dumpster at the marina, thats a good place for useful stuff that I can recycle. Hinged up, the mizzen mast is back a bit from here so the tiller is not going to get mixed up with it, but its well out of the way of any activity while anchored. The "new"plywood in the image is the beginnings of the anchor well, and no, I'm not planning to be up on the foredeck in any rough weather so its going back here, counterweighted by a big truck starter battery up in the forward end of the boat that will run the radio, gps, nav lights and such. 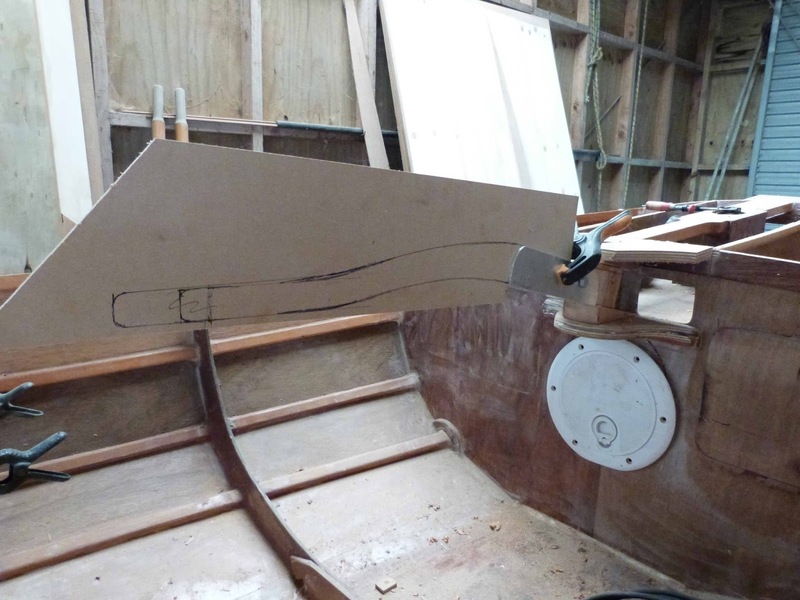 The rudder head and blade are coming up next, the rudder head is a bit unusual in that it is similar to the one on the Saturday Night Special in that it runs down past the boat bottom to the depth of the skeg and has an end plate so there is some steering even when the rudder blade is fully raised. On the SNS, the boat is able to be driven through very shallow water at high speed with the blade lifted, and for a boat that will be rowed or sailed into estuaries and over the mudflats this will be invaluable. 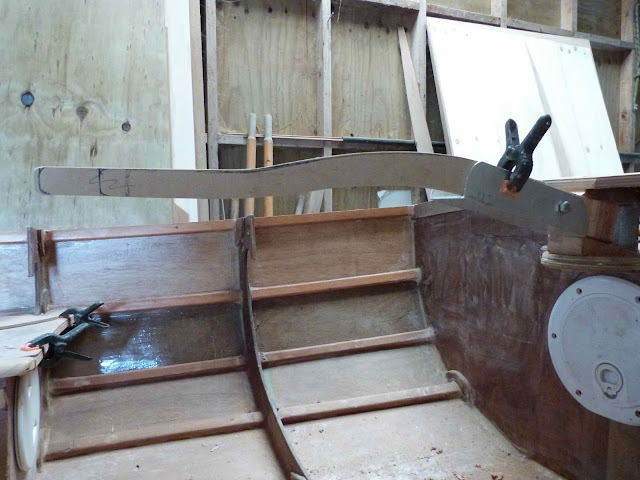 Once that’s done, it will be time to mount the tiller and rudder head then make up the yokes. I’ve a chunk of 6mm aly plate ready to cut up for that. My Swedish steel bandsaw blade with its hardened teeth will save me hours with a hacksaw. Watch this space.